In January 2012, I toured Los Angeles, California, stopping first at the Hollywood Bowl for a water display created and produced by LACoFD Truck Company 8. After that memorable experience, I headed south on Highland Blvd. through old "Hollywood 28". After postal Zip Codes came into use, that designation changed to Hollywood 90028. Even today, the cognoscenti are aware that real Hollywood resides within that one postal designation. Nearby areas pretend to be Hollywood , yet no other Zip Code can legitimately make that claim. At Sunset Blvd., I turned west and then turned south again to 709 North La Brea Ave. There I stopped for lunch. 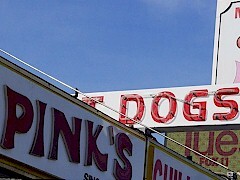 For readers who do not know that address, it is the location of Pink’s Hot Dogs. As the Great Depression wore on in 1939, Paul and Betty Pink bought a rickety pushcart and went into business selling hot dogs. 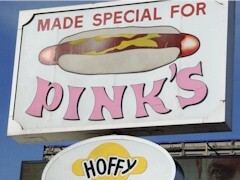 At the time, a Hoffy brand hotdog “made special for Pink’s”, served in a long split roll and ensconced in cardboard boat lined with an undersheet of wax paper, cost ten cents. If lunch at Pink's was then ten cents, was coffee a nickel? The Pink family built, or possibly remodeled the current building in 1946. In a nod to the diverse neighborhood in which it stands, one half of Paul Pink’s contiguous building still houses the Things-Antiques store. In 1939, when Paul Pink purchased his pushcart, my father was fourteen years old and living in L.A.'s Fairfax District. Each weekend, he would travel between his father's home in Los Angeles and Sunland California, where his mother and stepfather lived. In researching this article, I asked if he had any memories of Paul Pink’s that he might share. Here is what he had to say. On La Brea Ave., three blocks south of Pink’s is the local branch of the Bank of America (BofA). As Paul’s son told the story in a recent BofA Television ad, Paul Pink strode into the BofA branch one day and asked for a loan. The granting of that loan led to Pink's new location in 1946 and to an enduring business relationship. In July 2011, the Duke and Duchess of Cambridge made headlines with their visit to Los Angeles, and to legendary L.A. eatery Paul Pink's Hot Dogs. Although no one so famous as they were present in the Hollywood crowd, I noticed Spokesmodel Carrie McCoy,waiting patiently in line. “I’ll have the same, thank you”, I replied with a smile. We had places to go and things to see, so this was no time for a complicated order. As we wended our way through the slow shuffle of the line, I asked Carrie why she came to Pink’s Hot Dogs on that day. “For me”, she said, “it is all about Paul Pink. He was such a beautiful man”. “So, you knew Paul Pink personally”, I asked, somewhat surprised. “Yes. I was born nearby, at the Queen of Angles Hospital. My early childhood, I spent here in Hollywood. Later, in the 1980s, I worked at the BofA, here on La Brea Ave. Paul Pink would come in to deposit his cash receipts at our branch. I remember that he was happy and friendly to everyone he met. Almost daily, he would travel the three blocks from his store to the bank. Sometimes, he would bring hot dogs for everyone. It was always a treat to see Paul Pink. To me, 'Paul Pink’s' is the proper name for this place". After several minutes, our simple order of two chili dogs received top priority from the staff. Soon, Carrie McCoy and I were sitting out back in the patio area. It was late January in Los Angeles and we were out there having fun in the warm California sun. The food was so good that we finished eating in a matter of minutes. Although each of our meals cost more than ten cents, I must say that for me it really hit the spot. Thank you to Los Angeles native, Carrie McCoy for dining with us at Paul Pink’s. Her personal story added greatly to an authentic Hollywood experience, even if we were in Hollywood 90038.